LHCII- Light Harvesting Complex II is part of photosynthesis in higher plants, algae and some bacteria. It is the primary chlorophyll binding protein, andis associated with both of the Photosystems. LHCII also controls the lamellar structure of the thylakoid membrane. 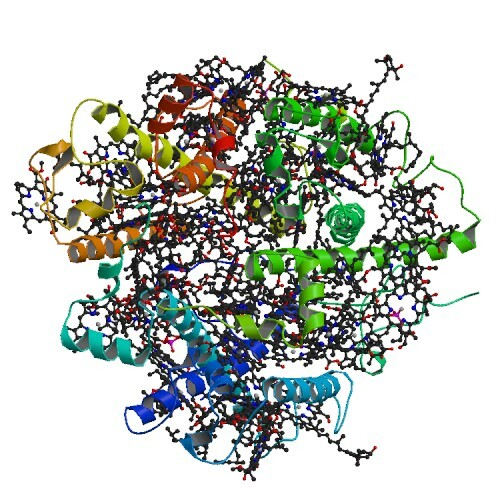 It exists as a trimer its natural state composed of a varying combination of three LHCII genes (LHCb1, LHCb2, and LHCb3). Is important to note that LHCII is a transmembrane protein consisting of three thrans membrane helices per monomer. Mechanisms of Photoprotection and Nonphotochemical Quenching in Pea Light-Harvesting Complex at 2.5 A Resolution. Standfuss, J., Terwisscha Van Scheltinga, A.C., Lamborghini, M., Kuehlbrandt, W.
This protein appears to be highly conserved in its internal regions as might be expected since variation in these reasons could have a large impact on protein folding. On the external surface of the protein there appear to be conserved regions intermingled with highly variable regions. It is likely that the conserved regions play a role in the functionality of the protein, whereas the variable regions probably do not. As this protein needs to interact with both chlorophyll and other LHCII proteins as well as PSI and PSII in order to perform its function, it is likely that these external conserved regions may be important for these interactions.